Leading ADHD experts give real-life answers to questions submitted by ADD adults and parents raising children with attention deficit disorder across a range of topics covering symptoms, school, work, and family life. Note on audio quality: This podcast is a recording of a webinar series, and the audio has been captured from telephone conversations, not recorded in a studio. 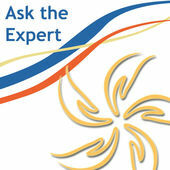 Ask the Expert is a webcast series hosted by the National Resource Center on ADHD, a program of CHADD. These webcasts give the ADHD community access to lead clinicians, researchers and other ADHD professionals on a variety of topics. 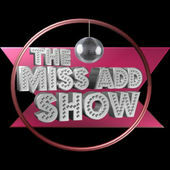 Get your ADD questions answered with Justine Ruotolo, a.k.a Miss ADD. Unlike most ADD coaches, she approaches ADD from the inside out to create lasting results. "ADHD strategies, ADHD diagnoses and ADHD Tips are NOT a part of this ADHD podcast," says host Tom Nardone. "If you are looking for tips, strategies, or methods to become a better person, then you should go elsewhere. In the ADHD community, there are plenty of people offering to help ADHD people be more productive. My wife and I are ADHD. We don't want to help you change. We want you to see you are not alone by allowing you access into our lives and into the lives of other ADHD people who are happy to be ADHD. We hope you will Join us as we put the awe in awesome!" We share effective tips and practices for working with Adult ADD / Adult ADHD in a natural, holistic way, without the use of medications. Hosted by Bahman Sarram and Michael Joseph Ferguson. For more info, visit: http://www.DrummerAndTheGreatMountain.com. LEGAL DISCLAIMER: The information shared on this podcast is intended solely for the purpose of personal growth, and not as a replacement for professional psychological support. The views and opinions of the hosts and guests of our podcast are not meant to be taken as medical advice. It is very important seek the help of a qualified medical practitioner when making any shifts to psychiatric medication you may be taking, or if you are experiencing extreme psychological distress. ADHD Essentials - ADHD Podcast for Parents and Educators. In-depth conversations about ADHD with parents, educators, and experts. Hosted by Brendan Mahan, M.Ed., M.S. ADHD Essentials helps you develop the skills and knowledges needed to better manage Attention Deficit Hyperactivity Disorder. Nikki Kinzer, PCC, is a certified ADHD coach. She helps people develop positive strategies to manage time, get organized, de-stress, and make themselves more productive. In her podcast, Kinzer looks at specific trouble areas for people with ADHD and gives you actionable tips on how to solve problems. These may include behavior techniques or new technologies on the market that can help keep you on track. The Adult Attention Deficit Disorders Center of Maryland is a collaboration between David W. Goodman, M.D., professor of psychiatry and behavioral sciences, and Valerie L. Goodman, LCSW-C, clinical psychotherapist. 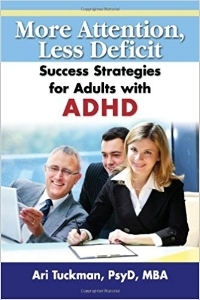 They provide a variety of educational and other resources to help people living with ADHD. Their podcasts and audio interviews address common issues people with ADHD might face, like being diagnosed with a mental health condition on top of ADHD. Dr. Kenny Handelman is a child, adolescent, and adult psychiatrist who is also an author and speaker. His books and podcasts focus on ADHD, and he tackles all sorts of topics: from medications to parenting, to the history of ADHD, and more. He shares his expert advice in each area. Tara McGillicuddy, an ADD and ADHD expert and the founder and director of ADDClasses.com, uses her podcast to discuss important issues and challenges facing people with ADHD. Together with expert guests, McGillicuddy tackles all sorts of issues, from planning ahead, to managing your finances, to stress management. Eric Tivers, LCSW, therapist, and coach, does things a little differently. He doesn’t just interview ADHD experts…he also talks to everyday people with the disorder. Listeners benefit from hearing strategies developed by the professionals, as well as stories they can relate to. Laura Rolands, founder of MyAttentionCoach.com, was a human resources professional for over 15 before becoming an ADHD coach in 2009. In her podcast, Rolands shares practical tips for being more productive with ADHD. She offers her own tips, as well as interviews experts on time management, mindfulness, and more. 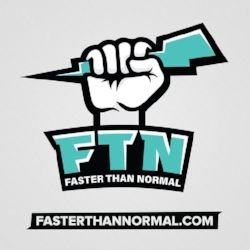 Jay Carter, host of ADHD Weekly, has the unique perspective of having being first diagnosed with ADHD at the age of 42. He began to learn more about the disorder and soon became a coach himself. Carter’s podcast discusses his personal tips and tricks along with advice from experts in the field. This ADHD Life is a podcast for people seeking to understand ADHD better, its weaknesses AND strengths, and how to improve their ADHD life. The host shares his experiences as both a recently diagnosed person with ADHD as well as his entry into the world of ADHD coaching. 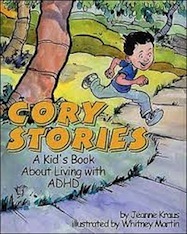 In short statements and vignettes, Cory describes what it’s like to have ADHD: how it affects his relationships with friends and family, his school performance and his overall functioning. Author, Jeanne R Kraus, is a teacher, curriculum specialist, author, humorist and speaker. 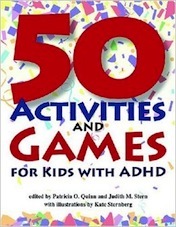 By Patrica O. Quinn, MD & Judtith M. Stern, M.A., Illustrated by Kate Sternberg The games, puzzles, activities, articles, and resources in this exciting collection from the newsletter BRAKES offer more than 50 ways for kids to handle the challenges of ADHD. Along with practical tips for solving problems and getting organized, boys and girls can also read about real kids like themselves. And they can discover a wealth of ideas that make life more manageable—and more fun! Written by Michael Gordon, PH.D, this books is designed to help siblings of ADHD children understand their brothers or sisters. It is explained in kids words the ups and downs of having a sibling with ADHD. From distinguished researcher/clinician Russell A. Barkley, this treasured parent resource gives you the science-based information you need about attention-deficit/hyperactivity disorder (ADHD) and its treatment. It also presents a proven eight-step behavior management plan specifically designed for 6- to 18-year-olds with ADHD. He offers encouragement, guidance, and loads of practical tips. There’s nothing more frustrating than watching your bright, talented son or daughter struggle with everyday tasks like finishing homework, putting away toys, or following instructions at school. Your “smart but scattered” child might also have trouble coping with disappointment or managing anger. Drs. Peg Dawson and Richard Guare have great news: there’s a lot you can do to help. Learn easy-to-follow steps to identify your child’s strengths and weaknesses, use activities and techniques proven to boost specific skills, and problem-solve daily routines. Small changes can add up to big improvements–this empowering book shows how. Now in its 20th year of publication, Putting on the Brakes remains the essential go-to resource for kids, parents, and professionals looking for tips and techniques on managing attention disorders. Written by two nationally recognized ADHD experts, Putting on the Brakes is loaded with practical ways to improve organizational, focusing, studying, and homework skills and contains more strategies for making friends, controlling emotions, and being healthy. This book gives kids with ADHD the tools for success in and out of school and helps them to feel empowered to be the best they can be! Organizing books fall short of addressing the unique needs of adults with ADD. They fail to understand the clinical picture of ADD and how it impacts the organizing process often making their advice irrelevant or frustrating when put into application. 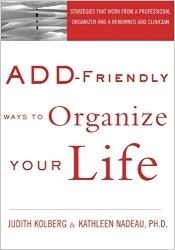 Books about ADD may address organization/disorganization but do so in a cursory fashion and on a very small scale in what are usually long books on the subject. This is a book that has ADD-Friendly advice with the ADDer in mind. This essential guidebook begins by describing how the ADHD brain processes information and how that leads to typical challenges that people with ADHD experience, as well as why certain strategies are effective and others aren’t. This lays the foundation for everything that follows, from getting diagnosed to an overview of the research of how ADHD affects people’s lives. If you suspect that your child has ADHD, you might find this book helpful as it provides some guidelines to see if your child needs to be considered for an ADHD test. 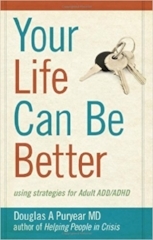 This book helps you get a better understanding of ADHD. It covers the comprehensive aspects of ADHD like types, causes, diagnosis and treatments, etc.If your child has been diagnosed with ADHD, this book provides a list of what to expect as your child grows up and it offers a ton of valuable information that you can use to help your child in coping with the disorder. 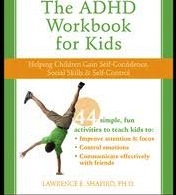 The author passes on his wisdom about how to help children with ADHD succeed, and includes medical, nutritional, educational, and psychological information in a format usable by parents, K-12 teachers and school administrator professionals, and healthcare professionals. Awarded “Best Psychology Book of 2010” by ForeWord Reviews, this book is an invaluable resource for couples in which one of the partners suffers from Attention Deficit Hyperactivity Disorder (ADHD). It authoritatively guides couples in troubled marriages towards an understanding and appreciation for the struggles and triumphs of a relationship affected by ADHD, and to look at the disorder in a more positive and less disruptive way. This ADD book is different. It is by a psychiatrist, about his own struggles with ADD and those of his patients and his friends. It is personal, about real people coping with real problems. It is about strategies, not about medications or the history, definition or diagnosis of ADD. It is not academic. it is interesting and light reading, with lots of helpful information and ideas. Now in its second edition, this groundbreaking work unveils the hidden epidemic of depression, anxiety, and low self-esteem among women with ADHD. This comprehensive social-skills guide for adults with ADHD contains straightforward exercises and engaging tidbits that teach adults to overcome common problems like inattention, impulsive blurting, and more. Marriages (or long-term relationships) are seldom easy. 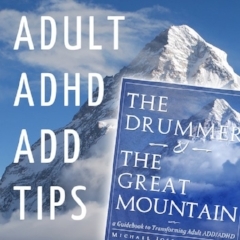 But when one or both partners has ADHD, this book’s tried-and-true techniques become essential to managing ADHD’s impact on your relationship. by Stephanie moulton Sarkis, Ph.D. This easy-to-read “first step” manual for adults with ADHD covers diagnosis and treatment, treatment, plus simple solutions for everything from managing ADHD at work to making lifestyle changes. by Peg Dawson , EdD and Richard Guare, Ph.D. This read will help you understand how ADHD may be holding you back in the workplace, and offer simple strategies for maintaining focus and meeting goals. Written by one of the foremost ADHD experts in the world, this book clearly outlines how to get the best treatment for your symptoms, what you need to know about medications, and how to fix damaged finances, relationships, and more. This book outlines a simple 8-step plan to improve your attention, increase your awareness, and gain self-acceptance through meditation. Sadly, loved ones can struggle to separate ADHD symptoms from “selfish” behavior — leaving everyone frustrated and angry. This book shows both sides to help nd solutions that work for all. Moving seamlessly from medical facts to easy-to-follow interventions, this book’s brief chapters make it readable — and valuable — for anyone eager to learn about ADHD’s symptoms, causes, drug therapies, and alternative treatments. The PBS documentary Misunderstood Minds shines a spotlight on this painful subject, following the stories of five families as, together with experts, they try to solve the mysteries of their children’s learning difficulties. Produced and directed by renowned Frontline filmmaker Michael Kirk, this 90-minute special shows the children’s problems in a new light, and serves as a platform to open a nationwide dialogue on how best to manage young, vulnerable, and misunderstood minds. Comedian Patrick McKenna seeks a diagnosis for Adult ADHD and learns the facts from an impressive array of experts (some of whom have ADHD themselves!) including medical researchers, psychiatrists, psychologists, professors, and award-winning authors. GORK! is a frank, intimate documentary about a family in Iowa navigating the challenges of raising a charismatic child with a mix of developmental disabilities (autism, ADHD, retardation). From his baby years as a foster child, through high school graduation, to his placement in an adult group home, the film explores the conflict, humor, hopes and frustrations in his family as Adam’s life unfolds. With over four million children now on behavior modifying medications, some starting as young as two years old, FRONTLINE continues its investigation into the controversial practice of medicating kids. Are the drugs safe? How young can you detect mental illness in a child? Is medication really the answer? As the debate grows more intense, FRONTLINE investigates the risks and benefits of prescription drugs for troubled children.